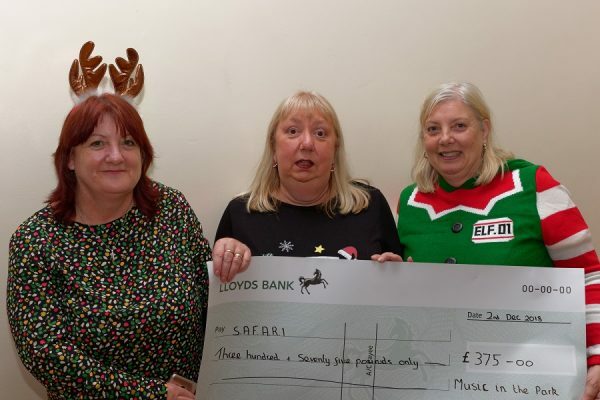 Music in the Park, Thame, has donated £375 to Thame charity Self-Advocacy For Adults Requiring Independence (SAFARI). A cheque was presented to the charity’s chair, Michelle Diffey, and Trustee, Linda Emery, by Chris Fram, Chair of Music in the Park’s organising committee (see picture). SAFARI will use the grant to help it fund music events. One of these was the SAFARI Christmas Party, which took place at Thame’s Guides Headquarters. The grant will also be used to help pay for an event next summer. > This year’s Music in the Park is on May 5 at Elms Park, Thame.